If you believe that professional speakers are not nervous when they step in front of a new audience, you are greatly mistaken. In fact, the fear of speaking in public is so great that some would rather have a tooth pulled – without Novocain – than to give a public speech. 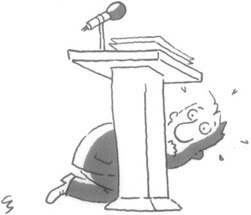 Fear of speaking in public even has a name, Glossophobia. To my knowledge, no one has ever died from giving a speech, barring the occasional assassination of political rabble-rousers. I did have one student faint in my class, a Marine Lance Corporal. The general rule is that the audience members are glad it is you up there and not themselves. The anxiety you have is natural and the physiology of what is happening is fairly simple to explain. You are entering the “Fight or Flight Mode.” You are exposing yourself to a group of people who will critique every aspect of your presentation, from your grammatical errors to the misspellings on your PowerPoint presentation. Adrenaline is flowing into your systems causing you to take shallow breaths and your body is getting ready to either battle or runaway. Blood is flowing to your core, thus the cold hands and feet, and turning stomach. Your muscles are tensing, thus your pain in the back or neck. Most books and lectures spend little time on how to alleviate the turning stomach, the dry mouth, the sweaty hands and the shortness of breath. There are usually three suggestions: Practice, practice, practice. I agree with this bit of advice, but there are better ways to help focus that energy to your presentation. Here are a few. Psychocybernetics: This is using the art of visualization as a practice tool. Do not just practice your speech in front of a mirror. Close your eyes and visualize the audience. Visualize giving the prefect speech with the appropriate audience reactions. Do it over and over again, at least five times. If you can “see” and “hear” the audience, your subconscious does not know if the experience is real or if it is Memorex. (A reference to an old television commercial.) In essence, you have given the speech five times already, so number six will be easier. Get Set, Then Meet and Greet: Get to the speaking venue at least 30-minutes before the meeting begins. Get use to the room and where you are going to speak. Make sure the microphone and projector are working, and your PowerPoint is ready. Then introduce yourself to individual attendees. Focus on a few individuals, their names and short stories. It is easier to give a speech to people you know than total strangers. Take a Breath and Step In: When you first stand in front of the audience, step back, take a deep breath and let it go, step forward and open your presentation. Do not hesitate. It is much like an Olympic ten-meter platform diver. They stop, take a deep breath and let it out, and then step into the dive. Golfers do something similar. They stand behind the golf ball, visualizing where the ball should go, take a deep breath, let it out and approach the ball. Step Back, Step In and Go: Even if you are reading your script, you will occasionally get lost or forget what comes next. There are two tricks to use to get around the embarrassment. First, underline or highlight key words in your script or use a Key Word Outline. When you get lost, step back, find a key word, any key word, and step forward and restart your speech from there. Few, if any, will know that you skipped a section. The Linus Blanket – You remember Linus from the Charlie Brown comic strips. He is always carrying his blanket for security. You can do the same, but without the blanket. I usually suggest that you bring a glass of water to the lectern or placed on a table where you are presenting. I sometimes suggest that you bring your personal glass or mug. Two things are happening here. First, this is something you are familiar with and increasing the comfort level. In fact, you should practice with your glass close by. Second, if you get lost, stop, take a sip of water, find your key word and go. The audience will not know if you have a dry throat, are nervous, lost your place or have a natural stopping point in your presentation. Talk to a Few: It is easier to talk to three people than 30. Choose three people in the audience with “kind faces;” one in the front row, one center and one in the back of the audience. Make sure one is on the right side of the venue, one on the left and one center. Focus on these three individuals during the speech. It will look like you are scanning the audience when you are only “seeing” three faces. These are only some of the “Rules” you need to know to make your presentation more professional. For more information or assistance in designing your next presentation, contact David Rosman and InkandVoice Communication at 573-999-0982 0r write us at Dave@InkandVoice.com. This entry was posted in Business, Business Communication, Organizational Communication, Public Speaking and tagged anxiety, audience, Fear, practice, Presentation, Public Speaking, Speaking, Speech. Bookmark the permalink. Excellent comments and advice in this column. Here is a slideshare post on the same topic with additional perspectives on the fear and ways to lessen it.